The University of Aalborg complained about an insufficient supply of spare parts of one of their previous microphone suppliers. Furthermore, the operation of the equipment was inconsistent, they had often problems with the operation. All 60 lecture halls and 20 auditoriums of The Aalborg equipped with Sennheiser products by default. The strategy: For larger rooms SpeechLine Digital Wireless Microphone Systems will be implemented. In smaller rooms analog Microphone systems from the EW series will be used. "Pick and speak, is the motto: that which previously took hours now takes just a few minutes"
Aalborg University has opted for a pure Sennheiser-based strategy in its programme to standardise 350 class rooms. High quality, simple-to-use and above all ongoing further product development are among the reasons why the Danish university has adopted this strategy. Aalborg is also very much looking forward to its new network-based chargers from the SpeechLine Digital Wireless series. 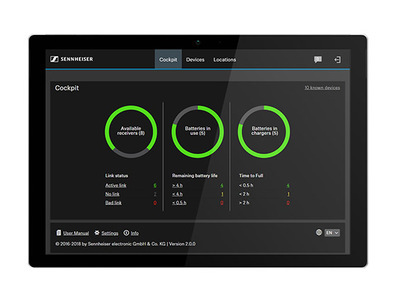 Using the IP network for equipment management will radically simplify support - and cut costs. 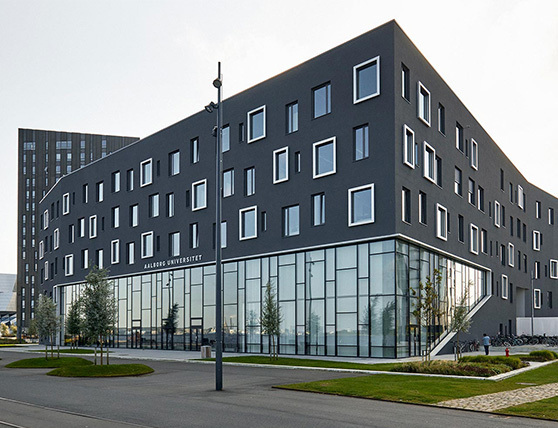 Profile Aalborg University (AAU) has been providing students with academic excellence, cultural engagement and personal development since its inception in 1974. It offers education and research within the fields of natural sciences, social sciences, humanities, technical and health sciences. A clear strategy: In 2015 Aalborg University (AAU) decided to standardise all of its 350 classrooms in 37 buildings. "The same equipment everywhere, the same buttons everywhere," says Per Mouritzen, AV director at the university, which is spread between three locations (Aalborg, Copenhagen and Esbjerg). Also in terms of microphone technology: the same manufacturer, everywhere. In the past, the university used not only Sennheiser products but also two other suppliers. Getting hold of spare parts for these products was not always easy, Mr Mouritzen reports; apart from which, having different systems also frequently created operational problems. "One headset has a mute button where the other has its off-switch." Per Mouritzen thinks that teaching staff should have things as easy as possible, which is why he and his colleague, Flemming Nielsen, decided to expand the current approx. 70 % standardisation into a pure Sennheiser environment. 60 smaller lecture halls and all 20 auditoriums (80 to 300 seats) will have exclusively Sennheiser-based audio transmission equipment in the future. One interesting thing: the university, which counts 21,000 students, has not only gone for the digital products of the new SpeechLine Digital Wireless series; it will continue to use tried-and-trusted analogue microphone products like the EW series. Around 115 EW 152 G3 headsets - the AAU has a preference for headsets - will be used in the smaller rooms, whereas the larger halls will use digital SpeechLine products. This is a decision driven by economics: Mr Mouritzen reports that his university lecturers can live well with the transmission quality of the analogue systems. And whenever an analogue headset hits the ground or someone treads on it, the replacement costs are less than for a similar digital product. Mouritzen: "Having both analogue and digital is a very successful combination. It is basically the same system with different designs. Users feel very much at home." When Mouritzen and Nielsen began looking for a microphone supplier for the new standardisation concept, they actually had Sennheiser in mind from the beginning. According to Per Mouritzen, he has "had 20 years of good experience with Sennheiser", and the university's two Danish integrators and suppliers also proposed Sennheiser products. The university was guaranteed that Sennheiser does not need several weeks to deliver spare parts. "If necessary, I just go to the next music shop and I've got it an hour later," Mouritzen says. The two AV technicians also checked out a Sennheiser reference installation during their decision making process and realised that the manufacturer had "lots of experience in the installation of a whole range of systems and antennas in large spaces." Those responsible also appreciated that the two local AV integrators as well as the managers of Sennheiser's Danish subsidiary were offering creative proposals how to solve AAU's AV challenges. One example being the table top CHG2 chargers, which guarantee that at least one headset is ready-to-use even if the other was not charged by mistake. Per Mouritzen and Flemming Nielsen also liked Sennheiser's suggestion to have a look at the new AWM4 antenna distribution system. This gives AAU the option of connecting up to 8 channels to one AWM4 unit and significantly reducing the number of antennas in the lecture theatres. This system is scheduled to be deployed in 2018. The University of Aalborg has also gone for the new SpeechLine chargers with four charging bays plus network connection (CHG 4N). This option means the chargers are independent of the power supply but also transmit important information via the IP network which is then processed in the Sennheiser Control Cockpit software. "This will revolutionise our support," enthuses Mouritzen about the new technology. Support staff at Aalborg University will in the future be able to look at their screens to know whether a microphone is switched to mute or not, they will know whether it is connected to the charger, they can search for it if it has not been on the charger for a longer period and can also see if the charge status is too low for an upcoming event. "This will obviously improve the work of our support organisation because trips and journeys to the systems can be avoided and many things can be dealt with online or on the phone," says Mouritzen about the new chargers, which are to be set up during 2017. In particular he likes the statistical functions offered by Control Cockpit: "If microphones in the charger indicate that they are being heavily used, then we can decide whether or not it makes sense to have more microphones available in that room." Aalborg doesn't intend sticking with its current 20 SpeechLine Digital-Wireless channels. It will be up to 56 by the end of 2017. Mouritzen and Nielsen are also planning to equip four auditoriums with Sennheiser's digital system. To date, this microphone technology had to be rented, for example for a specific event. In the future, SpeechLine sets will be available for users in a separate locked wall box. "Pick and speak," is the motto: that which previously took hours now takes just a few minutes," says a pleased Per Mouritzen. The popularity curve of the two AV managers is definitely climbing amongst users at the university. "Sennheiser technology is very easy to use and very reliable," Mouritzen says. The promised battery capacities are actually true, there have been no malfunctions so far and frequency problems or transmission break-ups are a thing of the past, especially in the larger lecture halls. 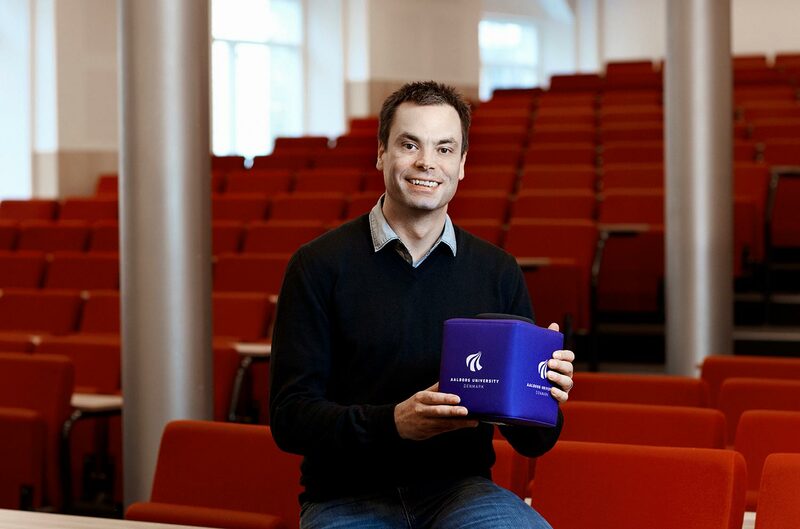 "Users are happy with the microphone technology because it is reliable," says Mr Mouritzen. He and his AV colleague are also making teaching staff and students at Aalborg University happy in other ways. They were fed up with the complicated passing around of microphones in the halls and so they tested the new Catchbox product - a foam cube into which a microphone can be packed and thrown around the hall. Catchbox is so successful that each auditorium now has one. The take-away: Sennheiser's hand-held microphones in the SpeechLine series survive their Catchbox flights without any problems at all. Per Mouritzen says: "This combination works."